The new head coach wasn't even allowed in... this is getting ugly! Everyone was hoping that backup goalie Juuse Saros would give the Flyers an advantage over the Predators, however, the netminder stopped 32 shots as the Flyers ended their five-game road trip with their fourth straight defeat. Michal Neuvirth made 26 saves for the Flyers. The players then decided to hold a closed-door meeting, as reported by team insider Sam Carchidi of The Inquirer. The interim head coach Scott Gordon, who has taken over the team since Dave Hasktol was fired, was then brought back into the room to face his players. No media members were allowed in the dressing room at that moment. “We’ve got to be better for 60 minutes. It’s frustrating,” said captain Claude Giroux, who has recorded a -4 rating over the last two games. 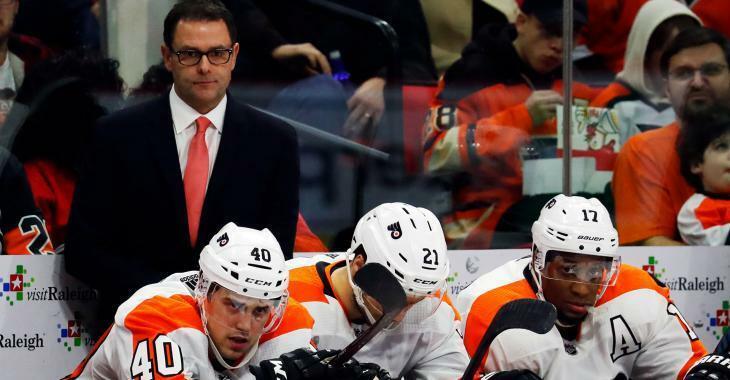 The Flyers have hit some many low points already in the 2018-19 season, it is hard to come up with solutions at this point for the struggling team. Several rumours have surrounded the Flyers, who keep shuffling lines and have started six different goaltenders since the start of the season. Trade chatter has said that new GM Chuck Fletcher might be looking to get an upgrade in between the pipes, however, it seems like an overhaul could be needed in the end. Veteran forward Wayne Simmonds, who is set to become an unrestricted free agent in the summer, is the one player that could bring the most interesting return ahead of the Feb. 25 trade deadline. It remains to be seen what Fletcher can put together to bring immediate help to his club. The Flyers' next three games are at home starting Thursday, as they face the Carolina Hurricanes next. They are just 7-8-2 at the Wells Fargo Center and have the second-fewest home points (16) in the NHL. Fans have grown impatient and it sure seems like the players have as well. No one will ever know what was said in this closed-door meeting, however, we are hoping for the Flyers fanbase that a strong message was said and heard in the dressing room.